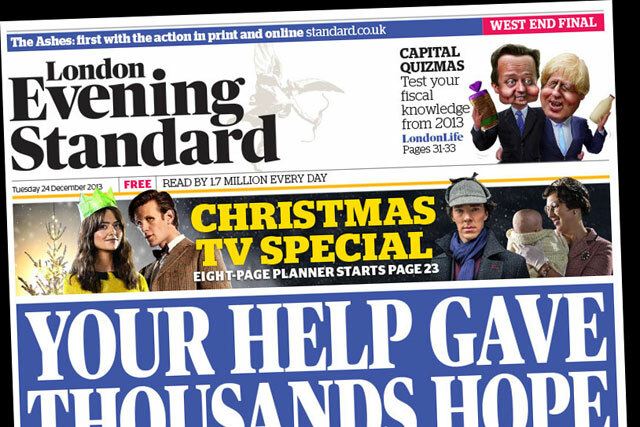 London Evening Standard has announced plans to "significantly increase" its print run from 700,000 per day towards 900,000 from next week, ahead of the launch of London Live, its local TV station. From Monday 13 January the London newspaper will begin extending its distribution from central city, tube and railway station locations out through to zone 6 and in to all 32 London boroughs. The distribution increase will eventually see The Evening Standard available at 250 new locations, including major transport interchanges and selected branches of major supermarket retailers, including Tesco, Sainsbury's, Asda, Waitrose and Morrison's. The distribution roll-out will build throughout January and will be complete in time for Evening Standard Limited's launch of London's new entertainment channel, London Live. With a recently relaunched digital version of the newspaper on iOS and Android, Londoners will have greater access to the Standard's news, features and comment – for free. When London Live launches in the Spring it will become the first 24-hour entertainment and news channel entirely devoted to the capital. It will be broadcast on Freeview, Sky and Virgin. Sarah Sands, editor of London Evening Standard, said: "The next 12 months are going to be exciting for the London Evening Standard. Through this increased distribution and the launch of our sister TV station we will be giving even more Londoners access to the very best reporting on this fantastic city." Since being bought by Evgeny Lebedev in January 2009 and dropping its cover price in October the same year, the London Evening Standard's distribution has increased from 250,000 to 700,000. The latest move is expected to take its reach "towards a target of 900,000". Andrew Mullins, managing director of Evening Standard Limited, said the extended print run forms part of plans to take Evening Standard "to the next level". He said: "2014 is a big year for the Standard, with enhancements to editorial content, a powerful multi-platform offering and the launch of our brand new entertainment and news channel London Live, we will now be able to engage with Londoners across the entire capital, providing a uniquely valuable audience offering for commercial partners." Will Lebedev's London Live be a success? Will the launch of London Live appeal to advertisers?